You earn your stripes by being eco-friendly! 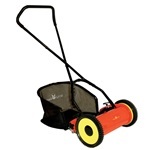 A great way to mow the lawn in an eco-friendly way is to invest in a manual push lawn mower. This does not require any electricity, power or petrol, you simply push and pull to let the rotating blades cut the grass. 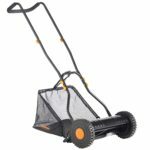 It may require a little bit more work than an electric lawn mower but it costs less to buy and has no operating costs. Manual push mowers may not always be the best choice, they are better for smaller lawns but to see whether it’s the best option for you check out the differences between a manual vs an electric mower. If you want to do your bit for the environment then choose from the best push mowers comparison table above. Whether you are environmentally friendly or you’re just old school, a manual push mower with a rear roller will leave stripes on your lawn giving it a neat and tidy look. You can also mow the lawn early in the morning as it won’t wake the neighbours up. 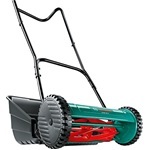 If you’ve opted to help the environment by going for a manual push lawn mower then you’ll need to find one that’ll make mowing the lawn a swift task. We’ll explain the features of a manual push mower below so you know what to look out for when buying one. Cylinder blades – The cylinder blades are used to cut the grass, if a push mower has more blades then it’ll cut more grass. These cylinder blades will cut your grass just like a pair of scissors would, leaving the grass looking neater and healthier. Rear roller – To get the stripe effect on the grass you’ll need to have a rear roller, this usually adds slightly more weight but it’ll make your lawn look nicer. 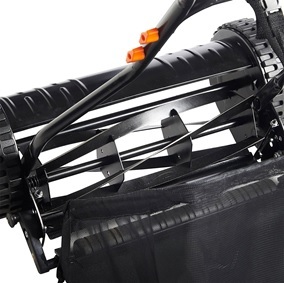 Cutting width – A wider cutting width will allow you to cut more grass with every push or pull motion, this will enable you to get the job done quicker. Cutting right to the edge may need to be finished off with a garden strimmer or garden scissors. Cutting height – Set the height at which you want the grass to be cut at. There are usually several height settings between a range as mentioned in the table. Grass collection box – When the grass is cut, the grass will spray backwards into the grass collection box, this will make it easier for you to dispose of the waste after. Make sure you don’t ruin any nice trainers, instead get a pair of gardening boots as these can be easily cleaned too. Some models may not come with a grass box, which you’ll have to pay extra if you require one. If you want to leave the grass clippings on the lawn this will help promote root growth which leads to a healthier lawn. 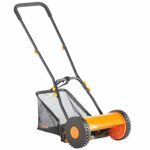 Weight – Heavier hand lawn mowers will be hard to push so might be more tiring, but heavier ones also probably get the job done quicker as they will usually have a wider cutting width which is one of the reasons it weighs more. Deciding on what type of lawn mower to buy can be tricky when you’re given so many options. If you were considering getting a push lawn mower, we’re sure you would have asked yourself, “or would I be better off with an electric mower”. This is the reason we’re going to list the pros and cons of each one so it’s easier for you to decide. 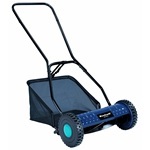 More suited for smaller lawns. Very quiet as a result you only hear the sound of the grass being cut. Cheaper to buy and no running costs because no electric or gas is required. Low maintenance as it only requires cleaning and blades to be sharpened with a sharpening kit when they get blunt. Gives the lawn a nicer and healthier look. The additional work required will keep you fitter. Have to mow the lawn frequently otherwise it becomes difficult when the grass gets longer. Not all grass will go in the collection box so will require more cleaning up after. Not good for bumpy and hilly lawns. Requires more work as you have to push and pull the hand mower with force. 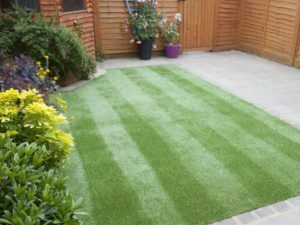 Various model options available therefore making it suitable for small, medium or large lawns. Doesn’t require as much effort even if the grass is long. Still ok to use on uneven surfaces. Don’t have to mow your lawn as frequently. Costs more money and also has running costs such as electricity or petrol. Noisy so will disturb others when in use. Cable can get in the way unless you choose a cordless or petrol model but it will cost a lot more money. A spinning blade is used, as a result the grass does not look that nice as it gets torn and shredded. Lawn does not look as neat once you’re done with it.